Stud ent loans are a $1.5 trillion crisis, but worryingly there are also around 1 million people that default on their commitments every year. But it doesn’t stop with student loans, as there are a number of other financial products that are placing tremendous pressure on consumers such as auto finance, personal loans, credit cards, and of course, mortgages. While there are a few simple steps that consumers can follow to minimize their debt, they can also expect some help from technology. There is no denying that the budget is the cornerstone of good debt management. Apps such as Mint and You Need A Budget (YNAB) are quickly becoming go-to apps for those who need to keep track of their monthly income and expenses. These apps provide a number of features that range from basic budgeting to a more in-depth analysis of monthly spend. When consumers can pinpoint what they spend their money on, this can free up some of the cash flow to clear off debt faster. Overspending accounts for many ruined budgets and an increase in debt and the only way to manage this is by stopping it in its tracks. A telltale sign of overspending is a maxed out credit card. Whether this is done through a wild shopping spree or unexpected medical expenses, living paycheck to paycheck is stressful and can be avoided. Apps such as Every Dollar provide users with the means to track their spending and the app can be loaded on your tablet, smartphone or laptop for easy access. Once users are more aware of their spending habits, they’ll be in a better position to reduce overspending on their credit card. Keeping track of debt payments and outstanding debt can be tedious, considering that the process often tends to be manual. With the help of apps such as Debt Payoff Planner and Debt Payoff Assistant, users have access to a simple overview of their current debt situation. 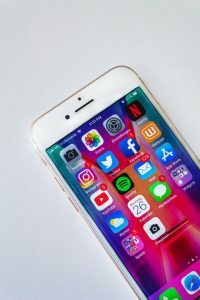 Not only can they track their payments with these apps, but will also be guided along various techniques of getting out of debt faster. With some guidance from the right app, consumers can manage their expenses more effectively to stay on top of their debt. They will also be able to navigate through their various financial products a little easier and have a greater understanding of what needs to be done to get those outstanding balances reduced.